Amazon Sellers need to know about intellectual property law..Especially if the Amazon seller’s account was suspended because of an intellectual property complaint. The intellectual property complaints that cause Amazon sellers’ accounts to be suspended are often referred to as rights owner complaints. Amazon Sellers need to know basic intellectual property law to avoid having their Sellers’ Account suspended. Amazon Sellers need to know basic intellectual property law to get their suspended sellers’ accounts back if they receive intellectual property law complaints. Intellectual property law for Amazon Sellers can be broken down into four categories: Copyright law for Amazon Sellers, Trademark law for Amazon Sellers, Patent law for Amazon Sellers and Trade Dress for Amazon Sellers. As Amazon Sellers become Private Label Sellers, they should file for trademark protection for their logo and the name of the private label brand they are developing. Copyright Law for Amazon Sellers. Copyright law for Amazon Sellers focuses mainly on images and verbiage. Amazon Sellers should never use photographs or images that they do not own. Amazon Sellers should take their own pictures for their listings. Amazon Sellers should not copy and paste verbiage from anybody else’s product or website and use it on their detail page. Design patents have to do with how a. product looks. Utility patents have to. do with how we product functions. Amazon Sellers need to avoid infringing upon patents owned. by others. Trade Dress Law for Amazon Sellers. Trade dress is the entire product including its shape, color, packaging and all of. the factors that make a product unique. Amazon seller should not copy products if they want to avoid rights owner complaints. However, Amazon does not seem to have the best system for rights owners to assert Trade Dress complaints. Amazon Sellers can apply for intellectual property right protection just like any other business or person. If an Amazon seller has developed a private label brand, they should file for protection of their mark. If they have developed a new design for an. existing product, they should file for a design patent. If they have made an entirely new invention, they should file for a utility patent. Amazon Sellers who are accused of violating intellectual property rights, may contact us for a free consultation. Amazon sellers can obtain international protection for their intellectual property in numerous ways. In Amazon seller can apply for a trademark in the United States and extend that protection through WIPO. WIPO stands for the World Intellectual Property Organization. Amazon sellers can also obtain protection around the world by filing for protection in other countries. Amazon Sellers should be concerned about obtaining. protection where they are selling their products and where they are sourcing their products. For example, an Amazon Seller who has developed a private label product and is having it produced in China should obtain protection in China. That Amazon seller should also obtain protection wherever his or her products are being sold. 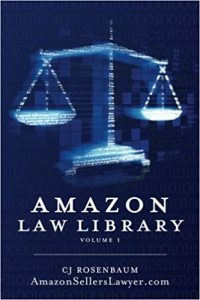 If you are an Amazon Seller and want to learn more about what courts have said in cases involving intellectual property issues, we wrote the book on cases involving Amazon and Amazon Sellers.